It's been one of those rainy spring days where the sunshine peaks through the clouds every now and again. It's still warm out, but there's a slight chill in the air that's begging you to put on a blue jean jacket or rain coat. At least, that's how the morning and early afternoon rounded out. And I do love these days in a whole different way than how I love bright and cheerful spring days that are full of sunlight. Luckily, I have been enjoying both types of weather this Thursday; the late afternoon has brought out the sun in full force and the temperatures have steadily risen. It means my evening will be spent on the deck, soaking up some much needed vitamin D. In all, I equate today to feeling cozy and happy, and with that I wanted to share a cozy and so simple meal that seems fitting for a day like today. You won't spend much time in the kitchen, which will give you plenty of cherished outdoor time. 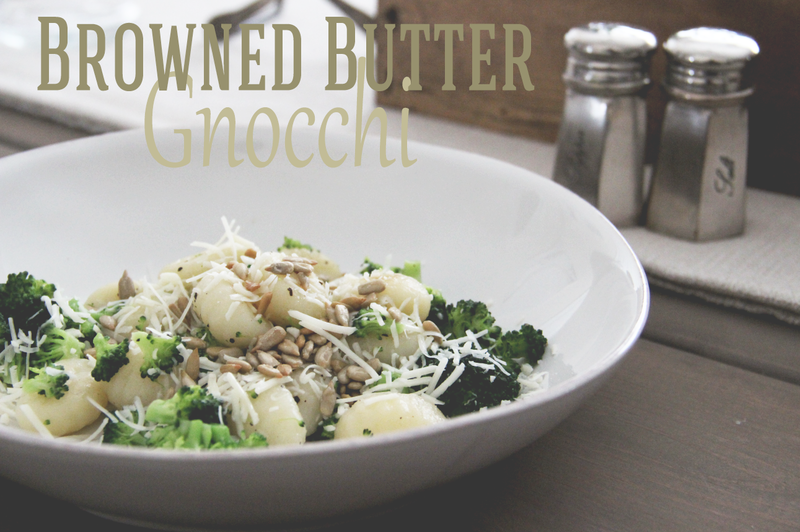 Plus, who doesn't love gnocchi?! And just in case you were stocking up on gnocchi meals, here's another gnocchi-filled recipe for a chillier day or one in which you're craving a creamy and hearty soup. Cook the gnocchi according the the package directions, adding the cut broccoli florets during the last minute of cooking. Cook for another minute, then drain. Over medium heat, heat the oil and butter in a large skillet. Cook until the butter starts to brown, but be cautious and don't let it burn. Add the gnocchi/broccoli mixture and the ground pepper to the skillet, tossing to coat evenly. Spoon out your desired helping, then add the sunflower seeds and the Romano cheese. And just like that, your meal is prepared and ready to enjoy! *This recipe is based on feeding two people with a slight amount of leftovers. To feed a family of four, just double the recipe. And so on for greater amounts.